The best Phi Phi beachfront resorts vary according to tastes and needs. Some say the key point is the beach. Others say it’s the Phi Phi views. Still more say it’s the type of accommodation and finally many say it's about the quality of the resort. Phi Phi is dominated by beachfront resorts so there is a lot of choice. Phi Phi beachfront resorts sit on all the main beaches of Phi Phi Island. 90% of the island is mountain, there are no cars and so, apart from the main Phi Phi Village and Loh Bagao- Lanah Bay there is no interior for any further accommodation. This makes Phi Phi a beachfront resort paradise. Phi Phi beachfront resorts do vary a great deal from the backpacker simple Rimlay Resort, Long Beach Bungalows, Phi Phi Beach Front Resort to the 4 and 5 star Zeavola Phi Phi Resort, Holiday Inn Phi Phi Island, Phi Phi Island Village Resort And Spa, Phi Phi Island Cabana Hotel. There are also an interesting collection of mid-range beachfront resorts some with great value. See all the Phi Phi Beachfront Resorts here. Normally land prices have ensured that budget Phi Phi beachfront resorts are rare but there are still a few simple places left. The wily locals know that beachfront command a premium so to get the best value you can take a room in the second row and get partial view of the ocean. The Phi Phi Beach Front Resort is more of a guesthouse set up but the Phi Phi Viewpoint Resort has some 820 THB a night (June 2012) rooms set 100 steps up the hill overlooking Loh Dalum bay with breath-taking views. The Tohko Beach Resort is on the remote Pak Nam beach and the resort is the old style and family run. From November to May 1st Phi Phi Hill Resort charges 720 THB a night for rooms in their resort that overlooks Long Beach and Phi Phi Ley. There is an excellent choice of mid-range Phi Phi beachfront resorts. Many of these hug Tonsai or Loh Dalum beach around the village. The Andaman Beach Resort and Phi Phi Villa Resort sit next to each other and have wonderful views of the Tonsai Bay and the cliffs of the islands. These resorts have many room types so it is normally easy to find something that suites. These resorts also have new deluxe rooms not on the beach but in the resort compounds. 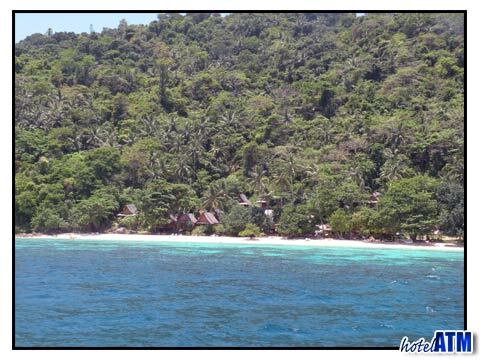 Phi Phi beachfront resorts on Long Beach enjoy particular fame amongst the 2 and 3 star resorts. All right on the beach and overlooking Phi Phi Ley, the coral reef and shark point the positions couldn't be better. These resorts are only 5-10 minutes by longtail boat taxi and so can easily take advantage of all the cafes, restaurants, bars nightlife of the village. Long Beach divers ensure the diving community are well served. Just a 10 minute walk over a small rise brings you down to the remote and even quieter Loh Modee beach, a great afternoon place to explore. Luxury Phi Phi beachfront resorts are primarily based on the northern beaches of Laem Tong and Loh Bagao. The Zeavola Phi Phi Resort, Holiday Inn Phi Phi Island and Phi Phi Island Village Resort And Spa all offer a high end range of room and service. The Zeavola Phi Phi Resort and Phi Phi Island Village Resort And Spa also offer exclusive pool villas for rent by the day as well as beachfront suites. The 5 star Zeavola has only 48 rooms so this one resort that needs to be booked well in advance especially for peak season, December 20th until January 20th. The Phi Phi Island Cabana Hotel straddles the two main bays and beaches of the main village and dominates the view from View Point. This is the main and oldest established hotel resort on Phi Phi Island. This has the convenient location, a superb swimming pool view and some great facilities. Being right on the village it is ideal for those who enjoy smart rooms but want to explore the local. Mama Beach Residence sits underneath on Tonsai Bay just off the coral reef and under the soaring Tonsai Towers, it is home of Phi Phi climbers. This boutique resort doesn't have many facilities; it just has 42 rooms but is well reviewed and popular.